"In the light of the moon a little egg lay on a leaf. "*********The Very Hungry Caterpillar is a classic children's story - the essential first book for babies. In this 2018 edition, Eric Carle's artwork has been restored to its original bright, bold colours. 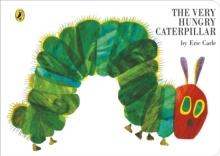 The Very Hungry Caterpillar has sold over 45 million copies worldwide. Its vivid and colourful collage illustrations and its deceptively simple, hopeful story have helped it become the most read children's book in Britain. With its die-cut pages and finger-sized holes to explore, this is a richly satisfying book for babies and toddlers. In this sturdy board book format, your little one is safe to play and tumble with their copy. This new edition also comes with an extra tough cover, so it can stay beautiful for longer.